People from Huddersfield and all across the nation have shown their support after footage of a young Syrian refugee being assaulted by bullies appeared online. 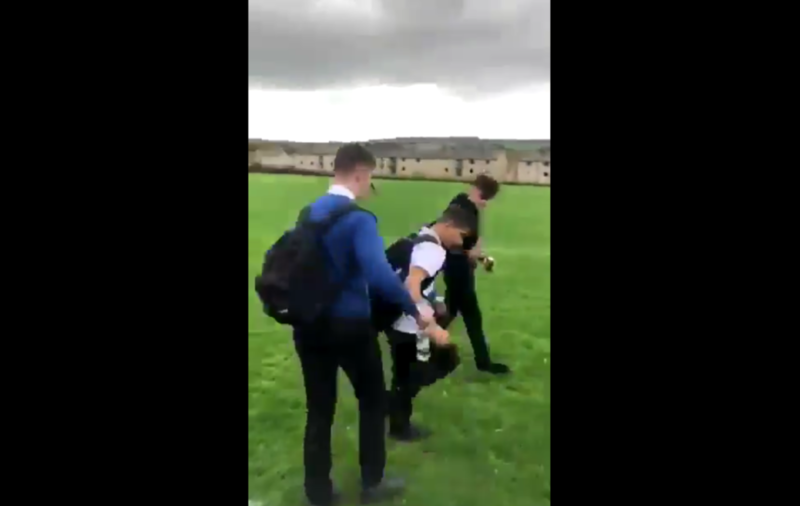 The footage, which was originally posted on twitter by user ‘blue days dark nights’ shows 15-year-old Jamal being verbally abused by another student before being headbutted and thrown to the ground. The victim was then held down by the throat and waterboarded while his attacker says ‘i’ll drown you’. The attack is said to have happened on the playing fields of Almondbury community school a few days ago. The original post quickly went viral and at the time of writing has over 60,000 retweets on twitter alone. A GoFundMe page has been set up in support of Jamal and his family and thousands have come out in support and solidarity after seeing the horrific footage. At the time of writing, in just 13 hours a total of 2,908 people have raised £43,555 for Jamal and his family. Mohammed Tahir, the person who set up the page, wrote: “Jamal’s family are refugees in the UK and they struggle to meet the basic necessities of life. “We want to raise money for the family to ease their situation and hopefully they can use the funds to help improve their quality of life and to put a smile on their faces. “Having left a war torn country, the least they deserve is to live in peace without being harassed”. Mohammed has also made sure that Jamal’s family is aware of the money being raised in support for them. “My friend does regular charity work in Huddersfield which involves giving food donations to refugee families. In an update on the page Mohammed confirmed that GoFundMe have been in contact and will make sure the money goes to the family properly. The campaign is also now trending on the website. It has been said in a statement by a solicitor that Jamal and his sister have been enduring a campaign of bullying by fellow students for months. Last month Jamal was assaulted by a group of bullies and his arm was fractured, requiring a cast, it is not known whether this was done by the same students in the video. Jamal’s sister has also been subjected to racist abuse by her peers, the constant nature of which led her to breaking her own glasses and using the resultant shards in an attempt to take her own life, which was fortunately unsuccessful. Almondbury Community School Head Teacher Mr Trevor Bowen has written to Parents and Carers of students in regards to the incident. In the letter he writes: “The safety and welfare of students is our number one priority and I can assure that this situations is being taken extremely seriously. “I can confirm we are working with the police to support their enquiries. “I want to be absolutely clear that we do not tolerate unacceptable behaviour of any sort in our school”. West Yorkshire Police have released a statement saying they are investigating the incident and are currently treating it as ongoing.